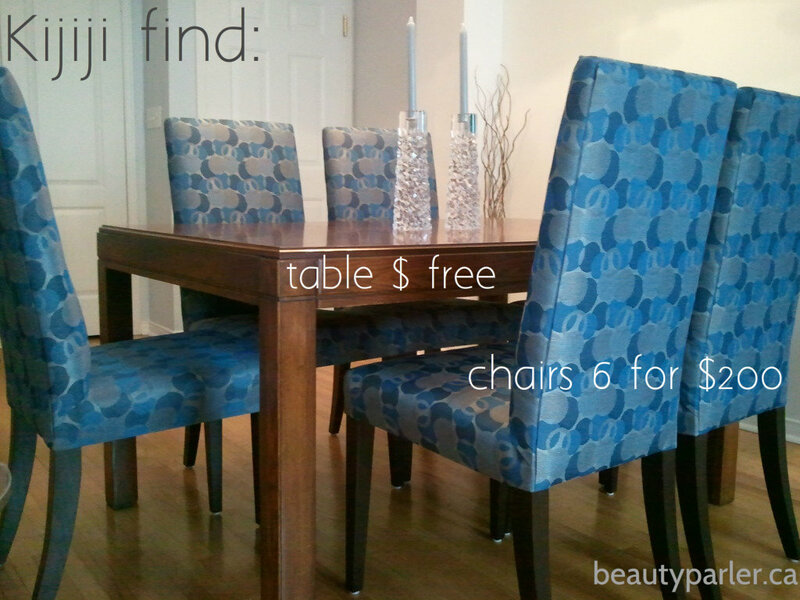 For the last few months I have been raving to all my friends about my amazing Kijiji finds! First, what's Kijiji? Basically, an online market where you can buy and sell basically anything. Like Craigslist. Back in December when my husband and I bought our first place the dilemma was how to furnish a new home on a limited budget. I didn't want to look at empty walls and sit on the floor and I also didn't want to "break the bank". So how does a newlywed couple afford decent furnishings without having to go the full IKEA route. OK so IKEA is great for accessories and dorm rooms but for a couple in their early thirties it was time to grow up. As we shopped around we realized that good quality furniture made with actual real wood is not that easy to find. Oh sure the shell is real wood but upon further inspection its all MDF. Quite frankly I don't feel like spending my Saturdays putting together furniture. So, nights on the internet with my new found friend Kijiji! also has two inserts so expands to sit up to 12 people! As for the resto chairs, originally I wanted Eames-inspired chairs but although Eames tulip chairs are stylish not so comfortable. 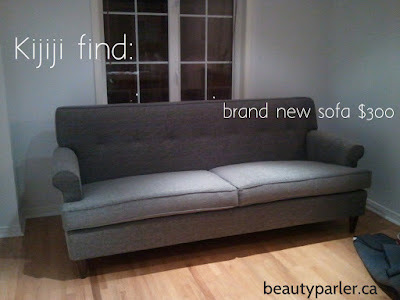 Brand new factory surplus sofa, score!! sofas & mattresses, as this was new major deal! This was my latest find and the hardest. 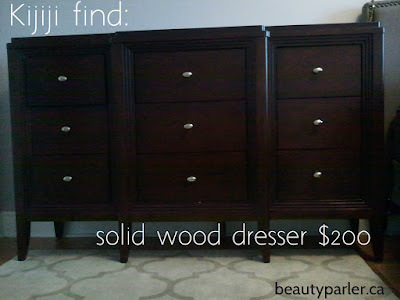 As I didn't want a match-y bedroom set most furniture stores will not sell dressers separately, surprisingly neither on kijiji. This was many nights of research! (1) Time & Patience: I found there was not one particular day to find amazing items. Originally, the idea was weekends were best but all the above items were found during the week. So perhaps less traffic! (2) Contact info: its so easy to contact the seller. There is an email feature with each item! (3) Watch: Not sure about an item, just watch it! Watch, is a feature indicated by a star. Just click on it & go back to it later. But you don't want to wait too long because its all about first come first serve. I didn't score all my Kijiji finds as I was late in replying to the ads. (4) Access: Have access to a MiniVan or SUV. This is where friends come in handy. So beer is good to have around too, for after the delivery of course! Have you ever purchased from an online market? If yes, share what you have purchased in the comment section. I love to hear about good deals!